On March 22, 2011, a M=9.0 great subduction zone earthquake occurred along the Japan trench, where the Pacific plate subducts westward beneath the North America plate. These plates converge about 92 mm/yr. I updated this page on 2018.03.11 with some new interpretive posters. I plot the seismicity from 2010.03.11 through 2018.02.10, with color representing depth and diameter representing magnitude (see legend). I include earthquake epicenters with magnitudes M ≥ 5.5. I also prepared these two posters with and without emag2 magnetic anomaly data (the file sizes are larger for these emag2 posters), with seismicity from 1918-2018 for earthquakes M 5.5. I plot the USGS fault plane solutions (moment tensors in blue and focal mechanisms in orange) for the M 6.8 earthquake, in addition to some relevant historic earthquakes. I note how that there were some crustal fault earthquakes in the Pacific plate that were triggered as a response to the M 9.0 earthquake. The modeling from Toda et al. (2011) tests this hypothesis with static coulomb stress modeling (the earthquakes are supportive evidence of their modeling). 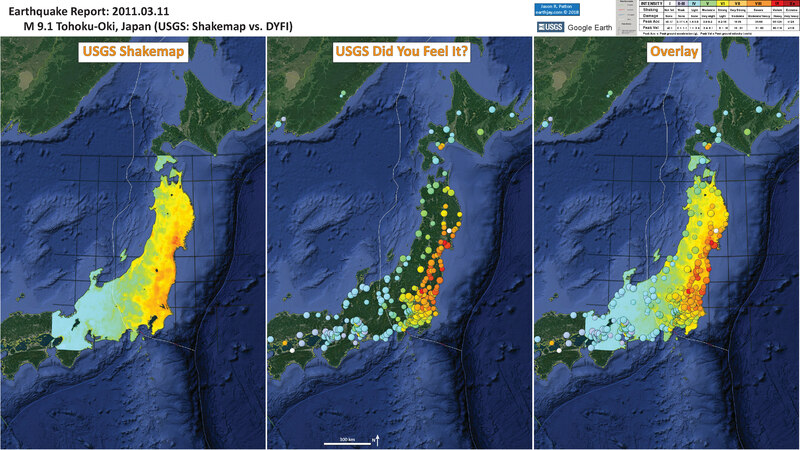 I also include the shaking intensity intensity on the map (shows where there is land). These use the Modified Mercalli Intensity Scale (MMI; see the legend on the map). This is based upon a computer model estimate of ground motions, different from the “Did You Feel It?” estimate of ground motions that is actually based on real observations. The MMI is a qualitative measure of shaking intensity. More on the MMI scale can be found here and here. This is based upon a computer model estimate of ground motions, different from the “Did You Feel It?” estimate of ground motions that is actually based on real observations. In the upper left corner is a low angle oblique view of the plate boundaries in this region (Lin et al., 2016). Earthquake slip regions for the major historic subduction zone earthquakes in Japan are outlined. In the upper right corner is a figure from Yagi and Fukuhata, 2011. This figure shows a map on the left, with color representing the amount of slip on the fault (over 50 m!!!). On the right are the seismographs plotted along strike (north-south). The red, green, and blue bands are the three main sub-events as recorded on these seismographs. 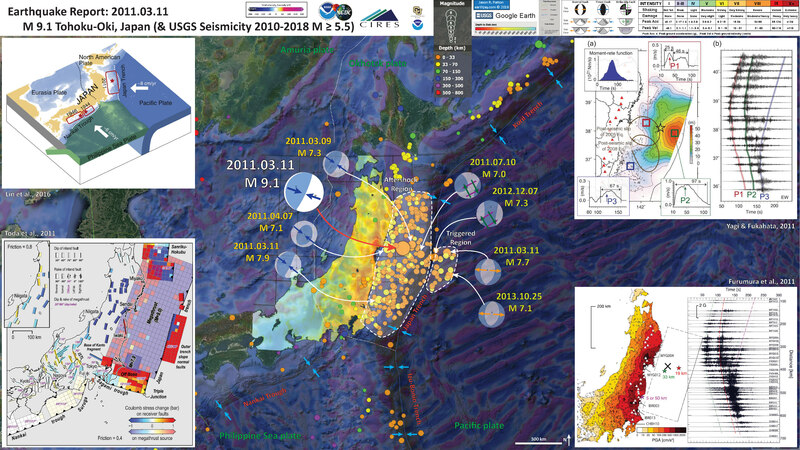 In he lower right corner is a map that shows an estimate of the ground motion shaking intensity from this earthquake (Furumura eta l.m, 2011). Note the similar record of seismographs. In the lower left corner is an illustration from Toda et al., 2011. This figure shows the results of their static coulomb stress modeling. Basically, this shows the amount of increased stress imparted on various fault types as a result of the 2011 M 9.0 earthquake. Here is the Yagi and Fukuhata (2011) figure. Total slip distribution, moment‐rate function, slip‐rate function, and strong ground motion. 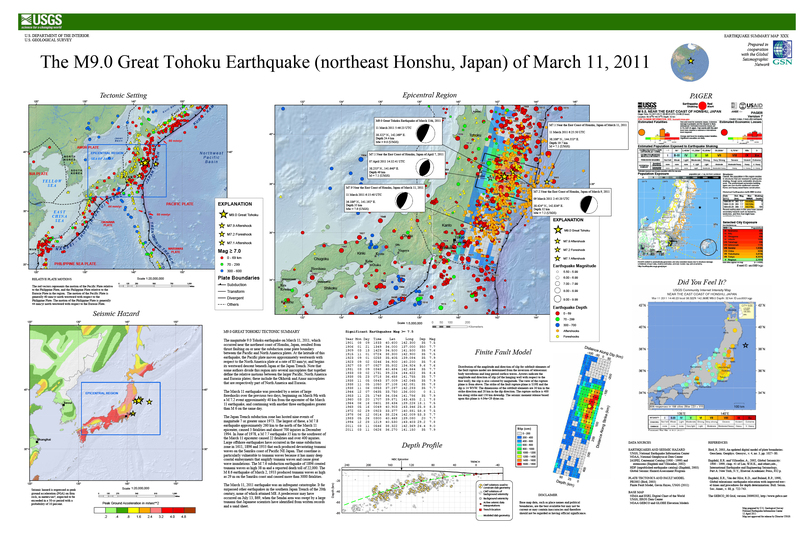 (a) Map view of inverted total slip distribution of the 2011 Tohoku‐oki earthquake (colors). Also shown are the first three‐days aftershocks (black circles) determined by Japan Meteorological Agency (JMA). The top left inset shows the moment‐rate function of the mainshock, and the insets of the other corners show the slip‐rate function at each space patch. The locations of the red, green, and blue patches correspond to the source regions of the 1978, 1897b, and 1938a earthquakes, respectively (see Figure 2). Post‐seismic slip areas of 2005 off Miyagi (Mw 7.2; north) and 2008 off Fukushima (Mw 6.9; south) earthquakes [Suito et al., 2011] are indicated by closed brown curves. The star represents the epicenter of the main shock determined by JMA. 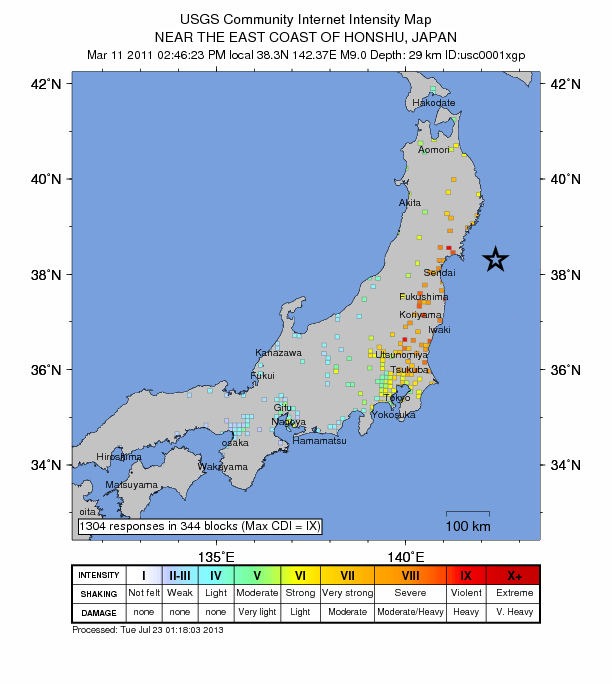 (b) Strong ground motion band‐passed between 0.1 to 5 Hz observed at K‐net stations by National Research Institute for Earth Science and Disaster Prevention (NIED). The K‐net stations are denoted by red triangles in Figure 1a. Red, green and blue lines show the theoretical arrival times of the shear waves generated by the peaks of the slip rate functions denoted by P1, P2, and P3 in Figure 1a, respectively. Here is the figure from Furumura et al., 2011). Color represents the ground shaking in units of g (9.8 m/s^2), PGA (peak ground acceleration). There are other measures of ground shaking that appear to be more relevant (e.g. Arias Intensity), but PGA is still a relevant measure. This shows the PGA with time (Furumura et al., 2011). Here is the Toda et al. (2011) figure, showing an increase in static coulomb stress along outer rise (the Pacific plate east of the Japan trench) and Sagami trough subduction zone settings. Stress imparted by the Wei and Sladen (2011) source model and the Mw = 7.9 aftershock to surrounding active faults (Research Group for Active Faults in Japan, 1991; Headquarters for Earthquake Research Promotion, 2011), resolved in their inferred rake directions (oblique rakes are labeled). Top and bottom depths of most of the active faults are set to 0 and 15 km. Here are some animations from the ARIA Project at Caltech/JPL. Beginning with a description of the animations in blockquote. 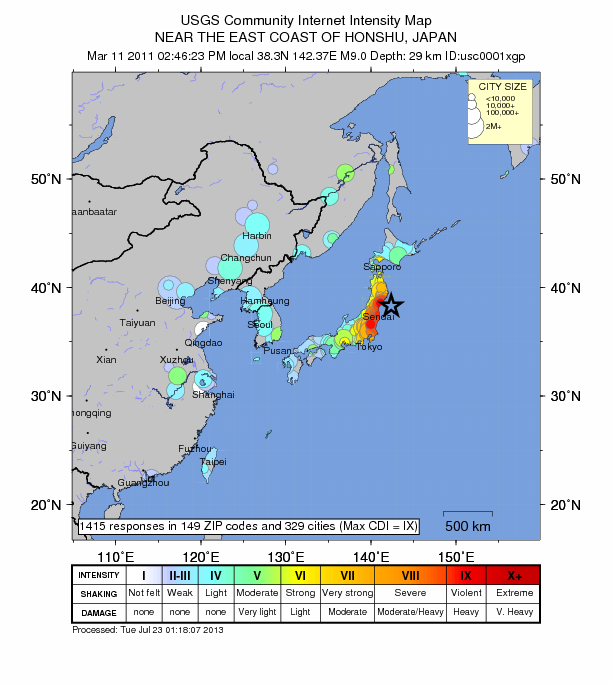 We show 2 videos on Japan’s movement over the 35 minutes following the initiation of the Tohoku-Oki (M 9.0). These images are made possible because of the density of GPS stations in Japan (about 1200 GPS stations, or a GPS station every ~30 km). The preliminary GPS displacement data that these animations are based on are provided by the ARIA team at JPL and Caltech. All Original GEONET RINEX data provided to Caltech by the Geospatial Information Authority (GSI) of Japan. This animation shows the cumulative displacements of the GPS stations relative to their position before the M9.0 Tohoku-Oki earthquake. The colors show the magnitude of displacement and the arrows indicate direction. We observe 2 kinds of motions, a permanent deformation in the vicinity of the earthquake (first red star) intermediately followed by a perturbation that travels about ~4 km/sec which are the surface waves generated by the earthquake. This animation shows the estimated instantaneous velocities of the GPS stations. In this view, we only observe the transient motion caused by the earthquake. The first waves to propagate from the mainshock (red star) are the body waves (P and S) but they can be barely seen (look for a slight purple perturbation). These are followed by the surface waves (Love and Rayleigh) propagating as 2 orange-red stripes, as surface waves generate larger velocities at the surface than the body waves. At about 25 minutes there is a subtle signal from seismic waves generated by a small aftershock in northern Japan. At around 30 minutes we observe the seismic waves from a M7.9 aftershock (smaller red star), the largest aftershock to date. Since this event is about 30 times smaller than the mainshock, the P and S waves from this earthquake are too small to be detected with these rapid GPS solutions, but we can observe the surface waves. The small patches of color that appear randomly across Japan show the noise level of the measurements and are not related to any significant ground motion. Here are some maps that are static results displayed in the above animations. Here are some animations from IRIS. First is an animation showing seismic waves as measured at stations associated with the USArray. Above is a screen shot and below is the embedded animation (with a direct download link). Here is the USGS earthquake web page for this earthquake. This is the attenuation with distance plot. This shows how the ground motions decay with distance from the earthquake. The March 11 earthquake was preceded by a series of large foreshocks over the previous two days, beginning on March 9th with a M 7.2 event approximately 40 km from the epicenter of the March 11 earthquake, and continuing with another three earthquakes greater than M 6 on the same day. The Japan Trench subduction zone has hosted nine events of magnitude 7 or greater since 1973. The largest of these, a M 7.8 earthquake approximately 260 km to the north of the March 11 epicenter, caused 3 fatalities and almost 700 injuries in December 1994. In June of 1978, a M 7.7 earthquake 35 km to the southwest of the March 11 epicenter caused 22 fatalities and over 400 injuries. Large offshore earthquakes have occurred in the same subduction zone in 1611, 1896 and 1933 that each produced devastating tsunami waves on the Sanriku coast of Pacific NE Japan. That coastline is particularly vulnerable to tsunami waves because it has many deep coastal embayments that amplify tsunami waves and cause great wave inundations. The M 7.6 subduction earthquake of 1896 created tsunami waves as high 38 m and a reported death toll of 22,000. The M 8.6 earthquake of March 2, 1933 produced tsunami waves as high as 29 m on the Sanriku coast and caused more than 3000 fatalities. The March 11, 2011 earthquake was an infrequent catastrophe. 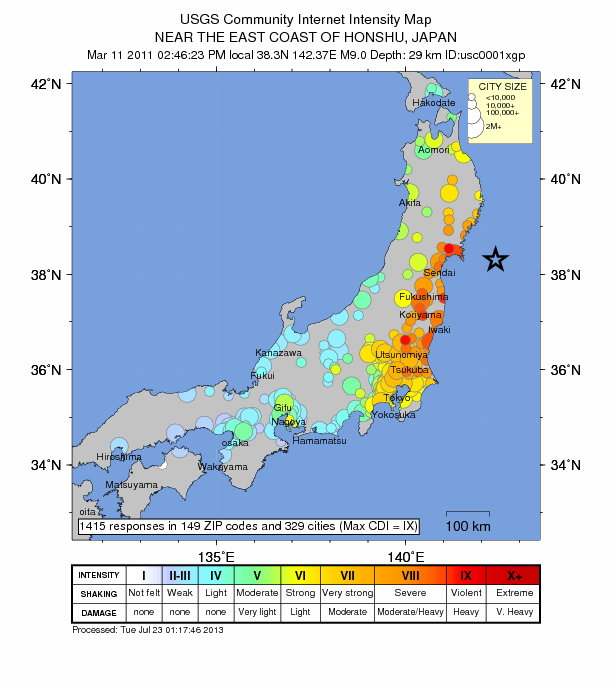 It far surpassed other earthquakes in the southern Japan Trench of the 20th century, none of which attained M8. A predecessor may have occurred on July 13, 869, when the Sendai area was swept by a large tsunami that Japanese scientists have identified from written records and a sand sheet. This one from Kosuga et al, 2011 show the aftershocks in 2011 as they relate to some historic earthquakes and their aftershocks. This most recent swarm appears to plot just to the south of the 1994 swarm. This Hirose et al. (2011) map shows focal mechanisms for select fore- and after-shocks, as well as the main shock. There were some large magnitude afteshocks in the segment that has swarmed in the past ~1 week. This Toda et al. (2011) map also shows focal mechanisms for related earthquakes, along with their slip model. Lets take a look at some of the earthquake slip models for the 2011 March 11 Tohoku-Oki M 9.1 subduction zone earthquake. There are dozens of them. Note where the slip was in 2011 and where this recent swarm is located. There are different sources of information that have been inverted for these source slip models. Some only use one type of data, others use multiple types of data (seismologic data, GPS data, tsunami wave form data, etc.). The best inversions include as many sources as possible. I posted these slip models first when I was reporting on some aftershocks on 2015/02/20 here. Ammon et a., 2011 show their slip inversion (GPS) along with the epicenters and their source time function plot. Fujitsu et al., 2011, inverted from tsunami wave forms. Gusman et al., 2013, inverted from tsunami wave forms. Iinuma et al., 2012 shows the seafloor displacement used in their slip model. Lay et al., 2011 b, showing their seafloor deformation using seismic data. Lay et al., 2011 a, using seismic, GPS, and tsunami wave inversions. This shows how the Lee et al. (2011) slip model incorporates the three main sub event slip patches through time (with the source time function plotted as well). Here is one of the more comprehensive figures from Yagi et al., 2011. They plot their slip model (seismic data), historic slip patches, source time functions for the main sub-events, and the seismic waves, outlining the 3 main sub-events. This is Yagi et al.’s (2012) final slip distribution, the source time function for two patches, and the spectra of the slip rate. This is from Yamazaki et al., 2011 using GPS and tsunami wave inversions. This is from Yamazaki et al., 2011 showing the sea floor deformation used for their inversion. Shao et al., 2011. Slip models prepared by inverting teleseismic body and surface waves, followed by their figure caption as a blockquote. Comparison of surface projections of slip model I, II, III by joint inverting teleseismic body and surface waves. Yellow line highlights the 5-m slip contour. Red star indicates the epicenter location and red dots are the aftershocks within first 6 days from JMA catalog. White arrow shows the Pacific plate motion relative to the North America plate (Demets et al., 1994). (a) Model I. (b) Model II. (c) Model III. (d) Comparison of moment rate functions of UCSB Model I, II, and III. Lets now compare the 2011 earthquake with historic earthquake slip regions. Lets also look at the regional slip deficit and how this recent swarm may fit into the bigger picture of this part of this subduction zone. Slip Compared to historic earthquakes and pre- and post-seismic slip, etc. Ito et al., 2011 2011 slip compared to historic earthquake slip patches. This Ikuta et al. (2012) plots shows the slip deficit for this part of the subduction zone. Basically, this is a way of viewing how much plate convergence might be expected to contribute to earthquake slip over time. In this case, we see how the smaller earthquakes took up some of the slip adjacent to the 2011 slip patch (think about where today’s swarm took place compared to the region that slipped in 2011). What about how the 2011 earthquake changed the stress on the fault in regions adjacent to the 2011 earthquake? Here are some plots showing the coulomb stress changes due to the 2011 earthquake. Basically, this shows which locations on the fault where we might expect higher likelihoods of future earthquake slip. 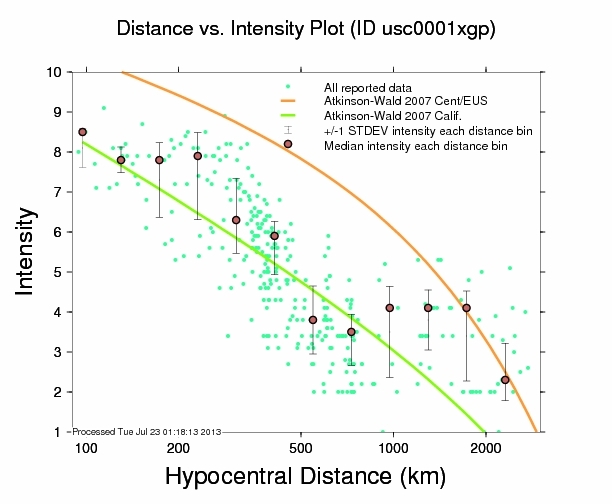 Yagi and Fukahata, 2011 shows the stress drop calculated from their slip distribution. This is a series of seismicity forecast maps from Nanjo et al. (2012; another way of looking at how the stress changed following the 2011 earthquake). Here is a cool plot showing Uchida et al.’s (2011) view of where the asperities are in this part of the subduction zone. There are two definitions for asperity. (1) the regions of higher slip and (2) the regions of the fault that store strain (like sea mounts?). They are related, but defined differently (most people conflate the two). This figure refers to type 2. How does this most recent swarm fit into this view of subduction zone faults? Here is the Yomogida et al. (2011) view of the segmentation of the subduction zone in 2011 Japan, 1964 Alaska, and 2004 Sumatra. Note how this recent swarm is in the northernmost segment (areas of lowest slip in 2011). This Orzawa et al. (2011) map is exciting because it shows the slip distribution for several earthquakes in this region… The 2011 in the south and the 2003 in the north (along with the 1994 slip in the center). Where was this most recent swarm? Ammon et al., 2011. A rupture model of the 2011 off the Pacific coast of the Tohoku Earthquake in Earth Planets Space, v. 63, p. 693-696. Gusman et al., 2012. Source model of the great 2011 Tohoku earthquake estimated from tsunami waveforms and crustal deformation data in Earth and Planetary Science Letters, v. 341-344, p. 234-242. Koper et al., 2011. Frequency-dependent rupture process of the 2011 Mw 9.0 Tohoku Earthquake: Comparison of short-period P wave back projection images and broadband seismic rupture models in Earth Planets Space, v. 63, p. 599-602. Kosuga et al, 2011. Seismic activity around the northern neighbor of the 2011 off the Pacific coast of Tohoku Earthquake with emphasis on a potentially large aftershock in the area in Earth Planets Space, v. 63, p. 719-723. Lay et al., 2011 a. The 2011 Mw 9.0 off the Pacific coast of Tohoku Earthquake: Comparison of deep-water tsunami signals with finite-fault rupture model predictions in Earth Planets Space, v. 63, p. 797-801. Lay et al., 2011 b. Possible large near-trench slip during the 2011 Mw 9.0 off the Pacific coast of Tohoku Earthquake in Earth Planets Space, v. 63, p. 687-692. Lay et al., 2011 c. Outer trench-slope faulting and the 2011 Mw 9.0 off the Pacific coast of Tohoku Earthquake in Earth Planets Space, v. 63, p. 713-718. Lee et al., 2011. Evidence of large scale repeating slip during the 2011 Tohoku‐Oki earthquake in Geophysical Research Letters, v. 38, DOI: 10.1029/2011GL049580. Newman et al., 2011. Hidden depths in Nature, v. 474, p. 441-443. Nishimura et al., 2011. The 2011 off the Pacific coast of Tohoku Earthquake and its aftershocks observed by GEONET in Earth Planets Space, v. 63, p. 631-636. Orzawa et al., 2011. Coseismic and postseismic slip of the 2011 magnitude-9 Tohoku-Oki earthquake in Nature, v. 000, p. 1-4. Satake et al., 2013. Time and Space Distribution of Coseismic Slip of the 2011 Tohoku Earthquake as Inferred from Tsunami Waveform Data in Bulletin of the Seismological Society of America, v. 1032, p. 1473-1492. Shao et al., 2011. Focal mechanism and slip history of the 2011 Mw 9.1 off the Pacific coast of Tohoku Earthquake, constrained with teleseismic body and surface waves in Earth Planets Space, v. 63, p. 559-564. Simons et al., 2011. The 2011 Magnitude 9.0 Tohoku-Oki Earthquake: Mosaicking the Megathrust from Seconds to Centuries in Science, v. 332, p. 1421-1425. Terakawa et al., 2013. Changes in seismic activity following the 2011 Tohoku-oki earthquake: Effects of pore fluid pressure in Earth and Planetary Science Letters, v. 365, p. 17-24. Toda et al., 2011. Using the 2011 Mw 9.0 off the Pacific coast of Tohoku Earthquake to test the Coulomb stress triggering hypothesis and to calculate faults brought closer to failure in Earth Planets Space, v. 63, p. 725-730. Uchida and Matsuzawa, 2011. Coupling coefficient, hierarchical structure, and earthquake cycle for the source area of the 2011 off the Pacific coast of Tohoku earthquake inferred from small repeating earthquake data in Earth Planets Space, v. 63, p. 675-679. Wang et al., 2013. 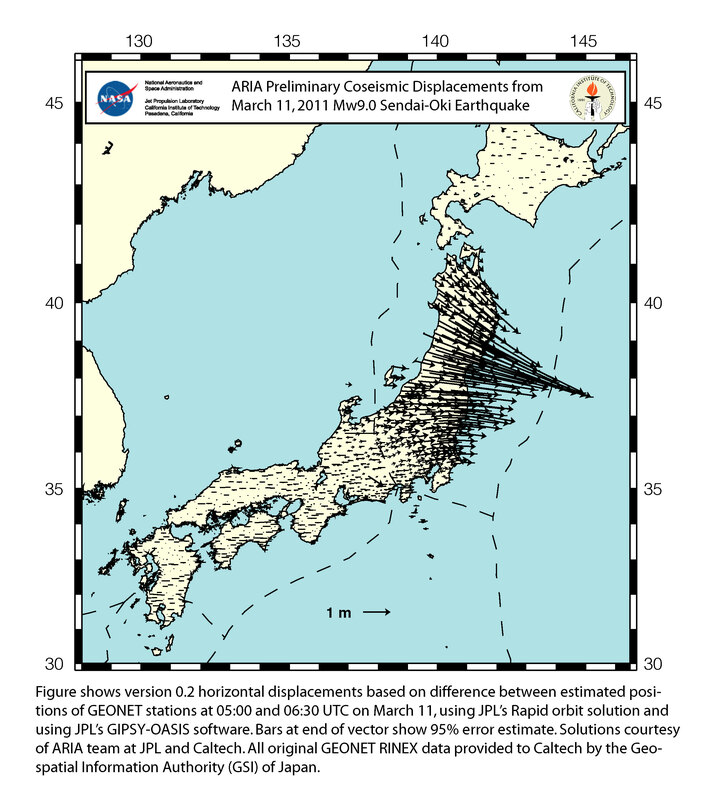 The 2011 Mw 9.0 Tohoku Earthquake: Comparison of GPS and Strong-Motion Data in Bulletin of the Seismological Society of America, v. 103, p. 1336-1347. Yomogida et al., 2011. 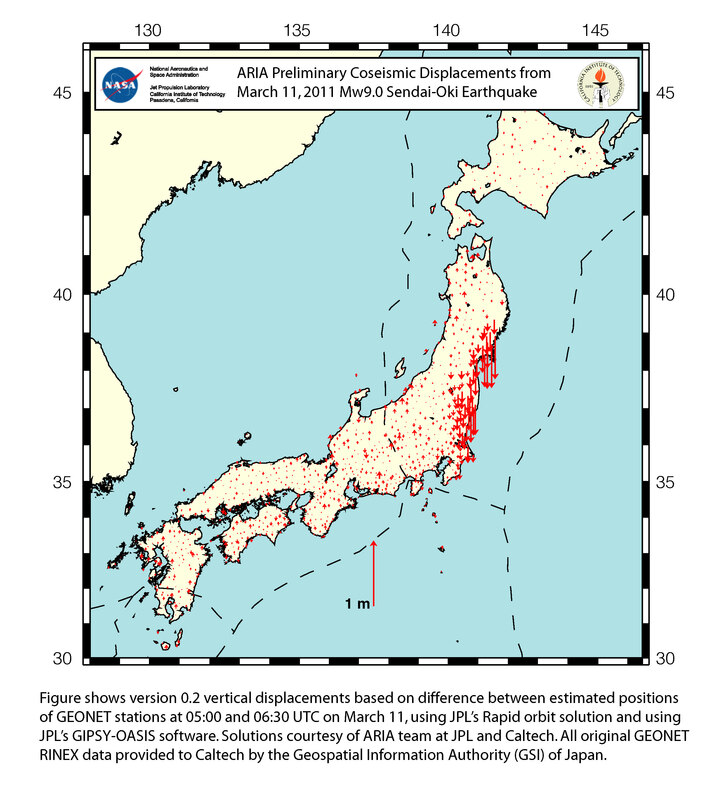 Along-dip segmentation of the 2011 off the Pacific coast of Tohoku Earthquake and comparison with other megathrust earthquakes in Earth Planets Space, v. 63, p. 697-701. Yue and Lay, 2013. Source Rupture Models for the Mw 9.0 2011 Tohoku Earthquake from Joint Inversions of High-Rate Geodetic and Seismic Data in Bulletin of the Seismological Society of America, v. 103, p. 1242-1255.